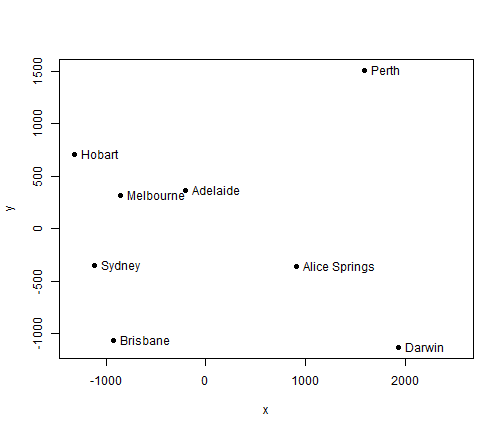 This page shows Multidimensional Scaling (MDS) with R. It demonstrates with an example of automatic layout of Australian cities based on distances between them. The layout obtained with MDS is very close to their locations on a map. 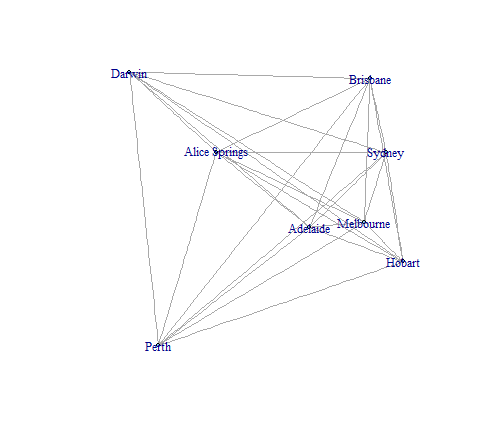 At first, the data of distances between 8 city in Australia are loaded from http://rosetta.reltech.org/TC/v15/Mapping/data/dist-Aus.csv. Alternatively, we can download the file first and then read it into R from local drive. Then we remove the frist column, acronyms of cities, and set them to row names. After that, we run Multidimensional Scaling (MDS) with function cmdscale(), and get x and y coordinates. Then we visualise the result, which shows the positions of cities are very close to their relative locations on a map. 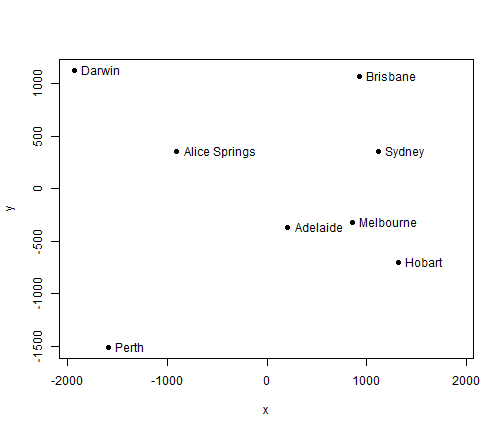 By flipping both x- and y-axis, Darwin and Brisbane are moved to the top (north), which makes it easier to compare with a map. MDS is also implemented in the igraph package as layout.mds. This entry was posted in R and tagged R. Bookmark the permalink. Nice example! I did something similar long ago using cities in the US (done in SAS). I told it to just use the rankings of distances since I was preparing for a social science example. It gave an almost identical result, which made me think that there was a bug in PROC MDS that let it still use the actual mileage. So I ranked it before passing it into MDS and, of course, the result was the same. Then I thought about all the constraints these many comparisons made, NY City is closer to Miami than San Francisco, etc. (but not by how much since it’s just a rank) and I realized how it could do it. I was using airline mileage and when I asked for a third dimension, sure enough, it showed NY City and San Francisco were “close” and Topeka was far away (center of the country, so higher in elevation). Fun stuff!